The FoMPS Yomp is our annual dads’ fundraiser/social event: a walk from Burnsall to Menston (approx 32km / 20 miles), taking in a few pubs along the way. This year’s event is on Saturday 18th May 2019. Meet at the school at 7.45 for an 8.15 departure. Places cost £25 which covers a coach from the school gates up to the starting point, breakfast and a meal. This event gets more popular every year, so secure your place today. Click the button below to reserve your place via PayPal. Thanks as always for your terrific support. Thanks to Justin Leeming for the photo. The Christmas Fayre is fast approaching. It’s on Saturday 1st December 2018, starting at 3pm through to 5pm. We will have all the usual favourite stalls including the ever-popular Tombola, the Christmas Raffle, Jolly Jam Jars, cake stall and café, including, hot pork rolls, mulled wine and hot chocolate, , plus of course the chance to meet Santa! Look forward to seeing you there! Please keep checking the website for more information as the big day gets nearer. The always popular Family Night returns on Saturday 11th February 2017 from 6pm to 8.30pm. There is no FoMPS Summer Fayre and Scarecrow Hunt this year, as we alternate arranging the Fayre each year with St John’s Church. Details of this year’s event on Saturday 2nd July 2016 are on Facebook. The FoMPS Summer Fayre and Scarecrow Hunt will return in 2017. We’ve had lots of texts from people who have found the balloons we released at the end of the Summer Fayre. Has your balloon travelled the furthest? Visit our Balloon Tracker and find out. It’s the Summer Fayre and Scarecrow Hunt this Saturday, 4th July. 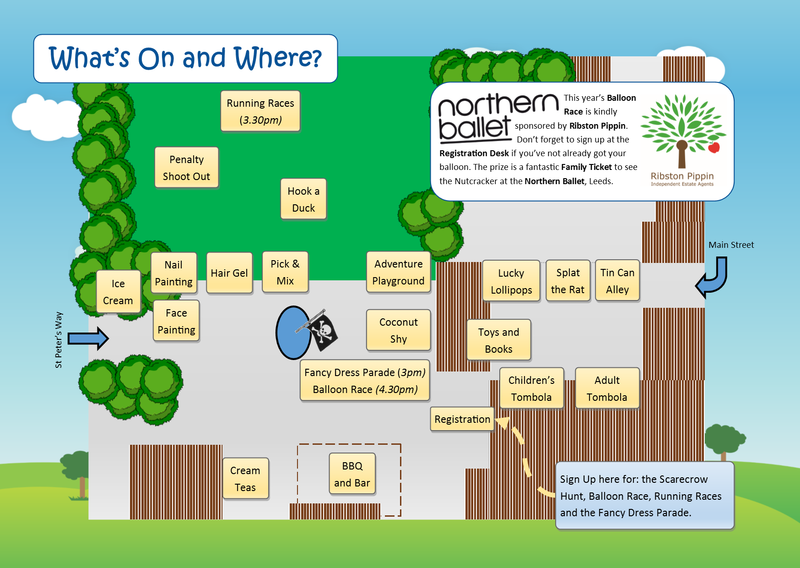 Pick up your Scarecrow Hunt Clue Sheet from the Registration Desk (see map) from 1pm. The Fayre runs from 2 until 4.30pm. Highlights this year include the Fancy Dress Parade at 3pm with a prize for the best dressed Children’s Book Character, Running Races at 3.30pm and the Balloon Race at 4.30pm. In between, pick up a hotdog and a Pimms at the bar and barbecue, test your skills in the Penalty Shoot Out, browse for a bargain at the book stall and enjoy games including Splat the Rat, Hook a Duck and Tin Can Alley.